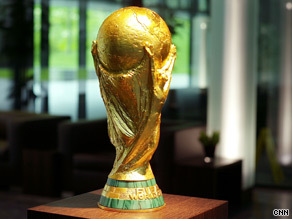 (CNN) -- Qualifying for the 2010 World Cup finals is reaching its climax, with footballing heavyweights such as Argentina, France and Portugal still battling to be in the hat when the draw is made in Cape Town on December 4. The ultimate prize -- 32 teams will be bidding to raise the winner's trophy in South Africa next year. Five-time champions Brazil, and dark horses Paraguay and Chile have clinched places in the South American zone, but struggling two-time winners Argentina are vying with Uruguay and Ecuador for the one automatic slot remaining and a play-off position. In Europe, 1966 champions England, Netherlands and European champions Spain secured three of the nine automatic places on offer to group winners in September, with two matches left. They were joined on Saturday by three-times winners Germany, defending champions Italy, Denmark and Serbia. Meanwhile, 1998 victors France must settle for a place in the playoffs, from where four nations will progress to the showpiece in South Africa, and Cristiano Ronaldo's Portugal go into Wednesday's final qualifier against Malta still seeking to achieve even that position. Ghana were the first country from Africa to clinch qualification, comfortably winning their group last month with two matches still to play, while the Ivory Coast joined them on Saturday to leave three other places still up for grabs. Which star players may miss out on the finals? In the CONCACAF zone, Mexico defeated El Salvador 4-1 on Saturday to secure their place, while the United States joined them after a victory in Honduras. Costa Rica and Honduras are battling it out for the final qualification place, while the fourth-placed team will go into a play-off position against the fifth-placed South American nation. In Asia, the four automatic places have been taken by Australia, Japan and North and South Korea, while Bahrain face a play-off against Oceania group winners New Zealand for the zones' remaining finals spot. Bahrain were held 0-0 at home in the opening leg in Manama on Saturday, with the return leg in Wellington on November 14. Australia, Japan, North Korea, South Korea. Denmark, England, Germany, Italy, Netherlands, Spain, Serbia.